January, 2015 – After three months of being in a holding pattern around Phoenix, Arizona, we are stretching our travel legs once again. But before we leave, I wanted to give you a glimpse of one of our favorite scenic drives in all of Arizona: the Bush Highway between the 202 Loop in Mesa and Route 87 (the Beeline Highway) in Fountain Hills. This is a jaw-dropping roller coaster ride that goes through some truly magnificent Sonoran Desert scenery. Saguaro cacti stand tall, set against a backdrop of colorful cliffs that come alive in rich hues of brown and burnt orange at dawn and dusk. The Bush Highway is one of central Arizona’s most inspiring scenic drives. Yesterday afternoon, we drove it once again, catching the “golden hour” light between 3:30 and 5:00. Even though we have driven this road and ridden it on our bikes dozens of times, I found myself hanging out the truck window yet again, snapping pics and marveling at the sheer wonder of it all. 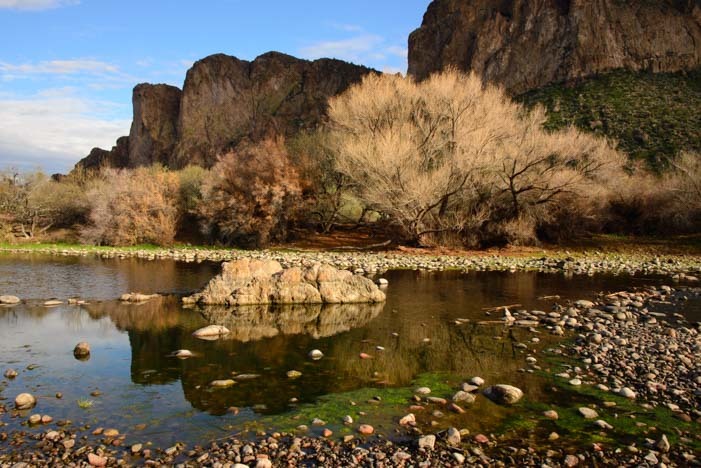 The rugged scenery along this drive features sweeping Sonoran Desert vistas and dramatic cliffs. The road follows the Salt River, and at various scenic overlooks you can get a wonderful glimpse of glassy water reflecting the colorful cliffs. We ran down to the water’s edge and picked our way over the rounded river rocks. The clouds were thick and low on the horizon. By turns, the sun came and went, making the sheer rock walls glow warm and then withdraw to cool shade. Along the water’s edge at the Salt River. 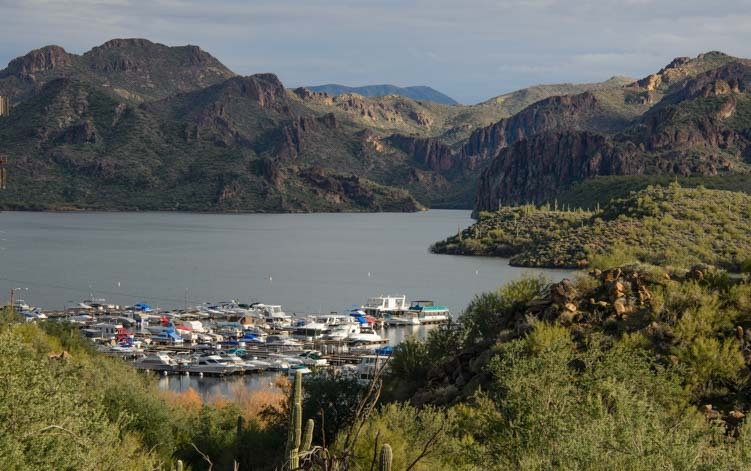 About midway on the drive, we passed Saguaro Lake, which has a small marina filled with pleasure boats that were gleaming in the sun. We didn’t go down to the lake this time, although there is a restaurant there with an outdoor patio that is an ideal spot for lunch overlooking the exquisite view. The boats at the Saguaro Lake Marina glisten in the sun. We carried on a little further instead, to a spot in the road where we had a wonderful view of the Four Peaks mountains. They were wreathed in soft, wispy clouds that hovered around them in a gossamer veil. After soaking in this gorgeous view, we turned around to drive back. A lovely sunset light show began to take shape around us. Once we had gone a few miles, we stopped to look back towards Four Peaks. The wispy clouds were still floating around the mountains, and the peaks were turning pink. 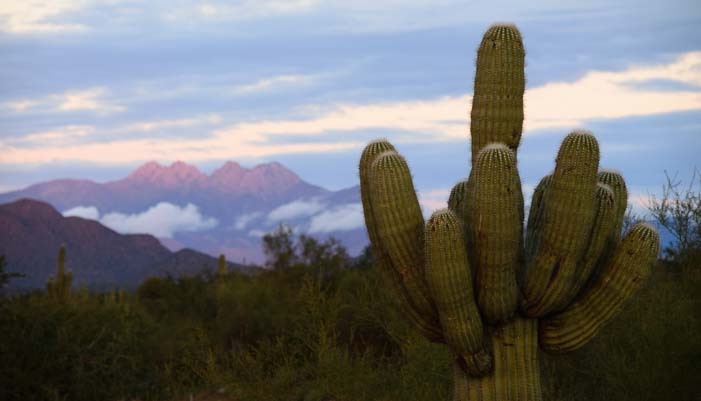 A beautiful saguaro standing next to us seemed to be enjoying the sunset colors on the mountains too! 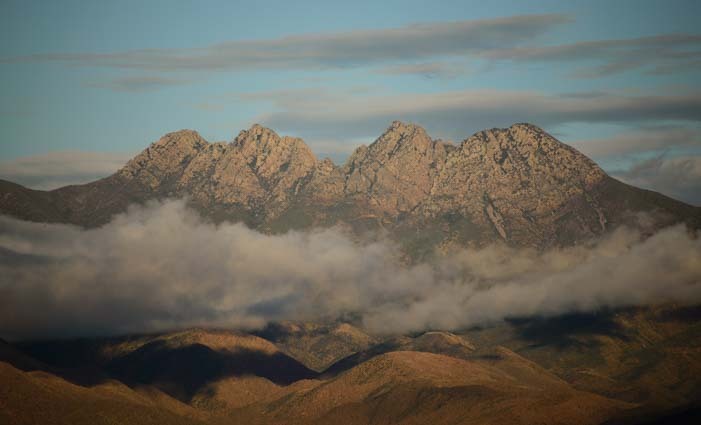 Behind us, in the distance, we see Four Peaks turning pink! What a majestic landscape, and how lucky we are to be able to spend time in such a beautiful place. 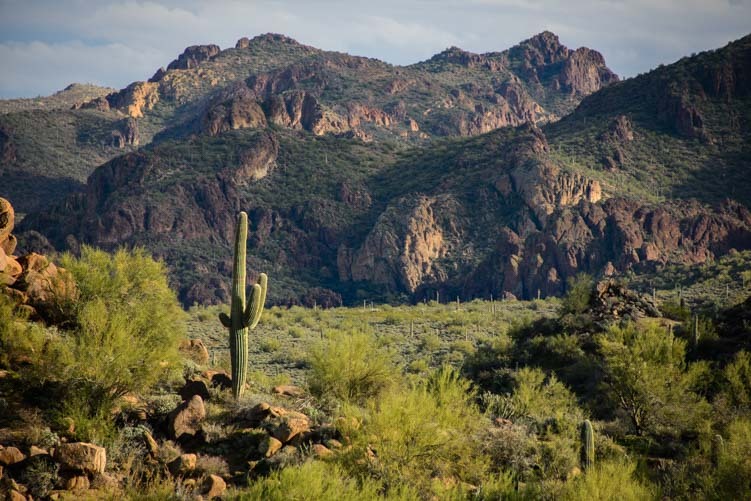 If you are visiting Phoenix and are looking for a pretty day trip out into the Sonoran Desert, take a drive on the Bush Highway! This entry was posted in Arizona and tagged Arizona, Arizona Central, Arizona Phoenix East, New, Travel, WP Travel by Roads Less Traveled. Bookmark the permalink.